The following information below is here to assist travelers in understanding their options as they travel to and through Brazil. You should check to see if citizens of your country are exempted visa requirements for Brazil by clicking here. All applicants under 18 years must provide a notarized letter of consent signed by either both parents or the legal guardian authorizing the Consulate to issue a visa as well as a copy of the minor's birth certificate. The passport presented at the Consulate with your visa application must be valid for at least another 6 months and must have at least one blank visa page available. Visa applications are received at the Consulate every business day on a first-come, first-served basis. The Consulate reserves the right to limit the number of visa applications received daily. Long-duration visas (valid for 5 or 10 years) are valid from the day of issuance while short-duration visas (valid for 30 or 90 days) are valid from the date of first entry into Brazil. All visa holders may only stay in Brazil for up to 90 days a year, unless otherwise noted on the visa. An extension of the may be granted by the Federal Police Department in Brazil, yet total stay should not exceed 180 days a year, unless otherwise noted. This covers visits to Brazil as a scientist, professor or researcher, participating in scientific or technological studies; an exchange student; a student at a practical course as part of professional or university studies; a trainee in the operation or maintenance of equipments or machines made in Brazil; a technician, volunteer, specialist, scientist or researcher who will work for government, private or non-governmental institutions, under a treaty of international cooperation; an amateur athlete under 21 years of age traveling to Brazil for intensive practice; for medical treatment; or volunteer or social worker without employment contract and payment, for community work or to render service to a religious institution. São Paulo-Guarulhos International Airport (GRU), nicknamed as Cumbica International Airport, is Brazil's busiest airport by passenger traffic, aircraft movements and cargo handling. Located in the district of Cumbica, in the city of Guarulhos in Greater São Paulo, it is located 25 km from Downtown São Paulo. As a hub for South America, Guarulhos handles 26 million passengers a year. It is the third busiest airport in Latin America. 3It is 35 min by car to the city. Congonhas/São Paulo Airport (CGH) - is one of São Paulo's three commercial airports, situated 8 ki lometers from the center at Washington Luís Avenue, in Campo Belo district. It is owned by the City of São Paulo and managed by Infraero. It was the 2nd busiest airport in Brazil both in terms of aircraft operations and transported passengers, handling over 15 million passengers. Congonhas Airport handles solely domestic flights, only serving a handful of Brazilian air carriers, such as Gol Transportes Aéreos, OceanAir, Pantanal Linhas Aéreas and TAM Linhas Aéreas. 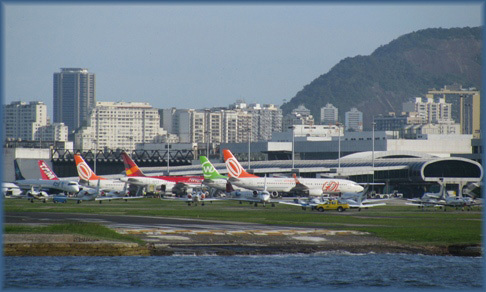 Rio de Janeiro Airport (GIG) - is the main airport serving Rio de Janeiro, Brazil. Operated by Infraero, it is the largest airport site in Brazil. It is the 4th busiest airport in the country with 10 million passengers and the 2nd busiest airport in terms of international air traffic in the country. Some of its facilities are shared with the Galeão Air Force Base of the Brazilian Air Force. The airport is located just 20 km north of downtown Rio de Janeiro on Governador Island. Zumbi dos Palmares International Airport (MCZ) located just outside Maceió has just a few international flights to Milan, Italy and Buenos Aires, Argentina, and mostly domestic flights from parts of Brazil like Rio and Sao Paolo. The major airlines in Brazil, such as, GOL, BRA and TAM, all fly to Maceio. Salvador's Deputado Luis Eduardo Magalhães International Airport (SSA) - is 28km from the city center. It is one of Brazil's main airports, having flights from all of the biggest Brazilian airlines, and receives flights from the main hubs of Europe, South America and the United States. These airliners provide inexpensive flights between Brazilian cities and some other Latin American countries. It can help you mix your flight connection city or entry city into Brazil in order to locate a lower cost trip. Brazil has a very good bus transport system. Long-distance buses in Brazil are a convenient, economical, and sometimes comfortable way to travel between regions. Bus terminals in cities are very important for transportation between cities. Brazilian bus stations, known as rodoviária or terminal rodoviário, tend to be located away from city centers, so it is best to take taxis to/from the station. Big cities like São Paulo and Rio have more than one bus station, each one covering certain cities around. Tickets can be purchased at the Rodoviárias, though, some bus company do offer internet ticket sales. The Bus station Rodoviaria Tiete is the main bus terminal in São Paulo serving major national cities and some South American countries. There are many places in São Paulo that you can only reach to by bus. The buses here are plentiful and frequent, but such an immense city can be hard to navigate at times. The routing information on the front and sides of the buses works are useful references. Buses cost R$2.30, which is paid upon boarding. Bus drivers generally don't stop for passengers unless they are flagged down. The system in Maceio is not very good. Buses are fine for some local trips. The current bus costs is R$2.10 for a single ride, and there are no transfers so you have to pay each time you board a bus. There are buses from the airport that runs to downtown Maceio. Salvador's main bus station is located n the middle of the new city, just 14km from downtown. The city is accessible via scheduled buses from all around the Brazil and from Paraguay. There are also local buses that can take you to many places around the city of Salvador and the metropolitan area. Brazil's railway system was mostly wrecked during the military regimes, so train service is very limited. There is the Trem da Morte which goes between Santa Cruz - Bolivia and Mato Grosso do Sul - Brazil. From Mato Grosso do Sul, there is a train or bus service that runs to São Paulo. The Serra Verde Express from Curitiba to Paranagu is a scenic 150 km ride that links the capital of Paraná to the coastal cities of Morretes and Paranaguá, through the Serra do Mar mountains. Train departs daily at 08:15am. Duration: 3hrs Price: R$ 50 (round-trip) Approx. There is also the steam train route between São João del Rei and Tiradentes. Trains depart Fri-Sun at 10:00am & 3:00pm from São João, and at 1:00pm & 5:00pm from Tiradentes. Duration: 35 mins Price: R$ 16 (round-trip) Approx. From Belo Horizonte to Vitória. Trains depart daily at 7:30am from Belo Horizonte, and at 7:00am from Vitória. Duration: 12h35 Price: R$ 25 (Single) Approx. From São Luis to Parauapebas - This train passes through the Amazon rainforest. Taxis are everywhere. It costs R$3,35 to get in the taxi, then it depends how far you go.Taxis from the city to Zumbi dos Palmares International Airport takes about 25 minutes. Taxis are a great way to get around São Paulo, especially late at night. Taxi stands are usually found on main intersections, such as, by a mall, squares, or parks. But you may hail taxis from anywhere on the street. However, you can also call radio taxis, for example, Radio Taxi Vermelho e Branco. Cost depends on traffic, since hte meter system is based on the time spent travelling from point to point. Taxis from the city to Guarulhos International Airport takes about 45 minutes. Getting around Rio by taxi can be more than a convenience. Most locals trust Rio's taxi network. Taxis in Rio are bright yellow and have the company's name and phone number stamped on them. The safest way to get around Rio by taxi is to obtain a recommendation for a radio taxi company from someone you know. When you enter a taxi, whether you hailed it or called a radio taxi, make sure the meter is zeroed when you get in. You should only pay what the meter shows when you arrive to your destination. However, you can expect to pay more between 9pm and 6am, when the rate is the so-called Bandeira 2, or Flag 2. Another exceptions to the rule is that taxis leaving from the Bus Terminal and the International Airport have pre-defined rates.